Wild and sparsely populated, Laikipia is the paragon of wildlife conservation. It is a vast expanse of natural country, high plains and rolling hills straddling the equator in the central highlands of Kenya, which roll out towards great plains. Righteously, this spectacular region is considered the gateway to Kenya’s wild Northern frontier country. Just get out of a vehicle somwhere and embrace the numerous safari activities that Kenya has to offer, be it walking, horse riding or bicycle safaris. Laikipia is about freedom and a chance to experience rich wildlife and the lifestyle of those who live here. 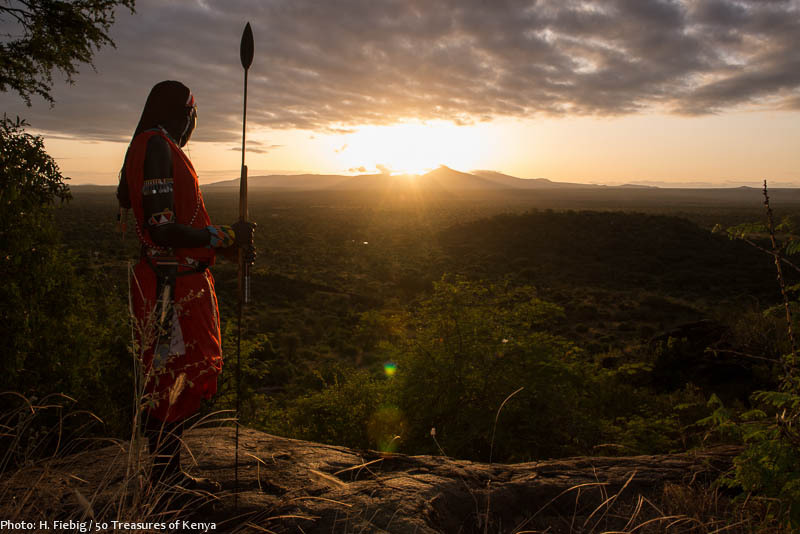 A Masai moran looks down from Mukogodo Escarpment to the hill bearing Il Ngwesi community lodge, and the sunrise behind. 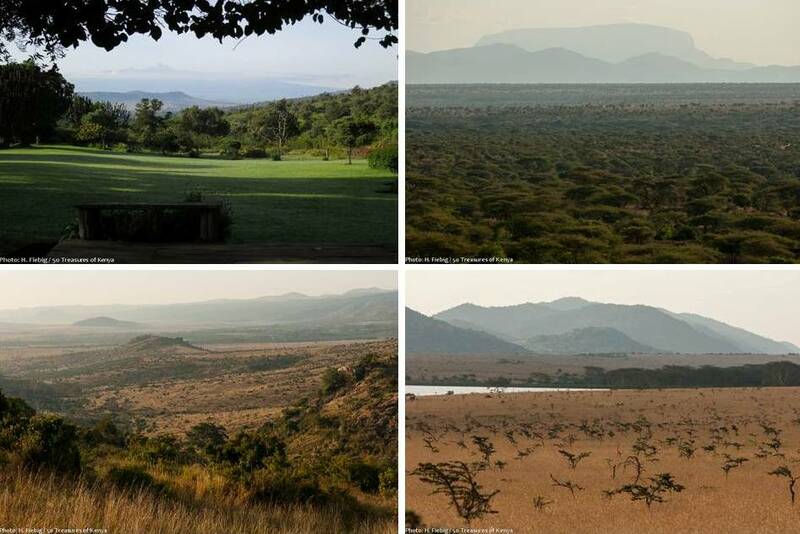 Extensive ranches of 3000-40,000 acres a piece cover much of Laikipia. These ranches have bolstered a sense of local identity and strengthened community ties. They are some of the best places in Kenya to learn more about traditional cultures and their role in the modern world. It is also an area of beautiful wilderness, where protected game roams freely and safely. Laikipia is one of only a few areas in East Africa, outside the jurisdiction of National Parks and reserves with sufficient natural habitat where wildlife can move openly across both private and communal landholdings. It is this confidence of both the people, and animals, in relation to their holistic approach to conservation that is the real essence of Laikipia’s character and success story. Standing on the veranda of Lolldaiga Hills’ Farm House, Mt. 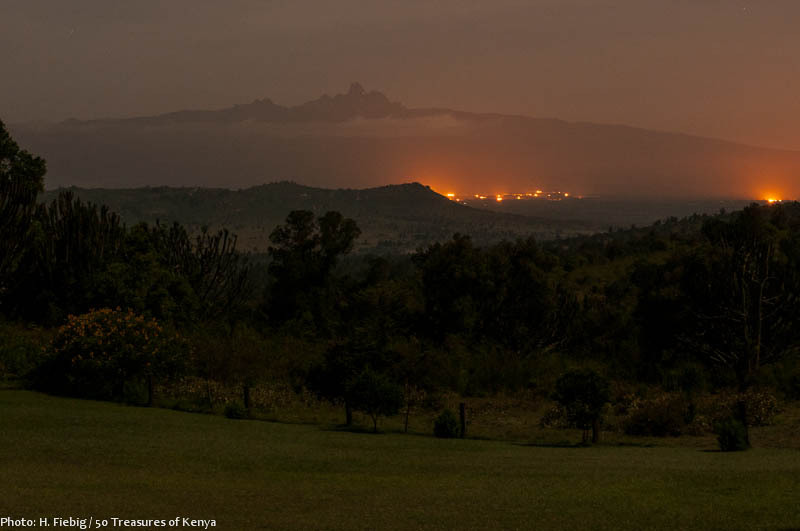 Kenya raises into the African night, mysteriously illuminated by the lighting of the green houses of the many horticultural farms on its slopes. Compared with the Rift-Valley, there are only few archeological sites in the area. However, the earliest signs of human presence in the region are hand axes dating back to the prehistoric eras. Other indications of long human settlement in the region include rock art, stone cairns and circles. Its inhabitants over time have included hunter-gatherers from the Mukogodo (or Yaaku) and Ndigiri groups, some of whose descendants still live in northern Laikipia. Another group, the pastoralist Wardei Darya, arrived later from what is now Ethiopia. 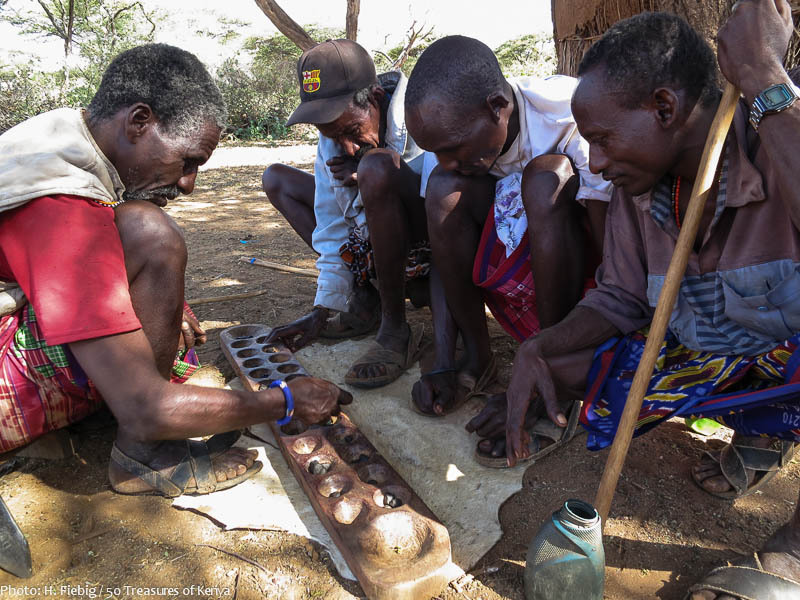 Elders of the Il Ngwesi Group Ranch can enjoy a game of Bao in the afternoons, as the conservation and tourism activities have opened alternative ways of income, the whole community profits from. The Mukogodo people, now know as Mukogodo Maasai, were specialist elephant hunters who adopted the Wardei Darya’s Cushitic language. It is still spoken by a few old people today. The Maa speaking pastoralists arrived much later in 1790s, displacing the Wardei Darya and continued to dominate the area for the better part of a century. Some groups such as the Mumonyot are remnants of the Laikipia Maasai while others descended from the hunter-gatherers formerly known as Ndorobos. Pokot pastoralists have moved into western Laikipia from the Rift Valley, while in northern Laikipia there are some Samburu pastoralists. The latest to come and settle in Laikipia were white settlers at the beginning of the 19th century. Laikipia is home to a most colorful set of people, a diversity which has greatly profited the area, here: Masai from Il Ngwesi, European living on Sandai, Meru guide in Ngare Ndare Forest. Thanks significantly to its people, Laikipia is now a haven conserving more than just wildlife, but also a way of life. By numbers, the Kikuyu today form the biggest population group, with the balance composed of several other ethnicities, including Laikipia born Maasai, Samburu, Meru, Borana, Kalenjin and Turkana. Other communities included are the Somalis, Kenyans with European roots and Kenyans of south Asian origin who run businesses in the urban centers in the region, giving the county a diverse population. As manifold as the ethnicity of Laikipia’s population is the amalgam of land ownership, which is either private or communal. Many things differentiate Laikipia from the rest of Kenya, but possibly the most significant is how people and cultures from different backgrounds have come together to support and undertake conservation for the benefit of both, man and game through their own organization, the Laikipia Wildlife Forum. It has been very active in promoting collaboration amongst its members and so this area has become an important conservation body, with ranches involving themselves in eco-tourism and conservation projects both within their own land and alongside, in the neighboring communities. 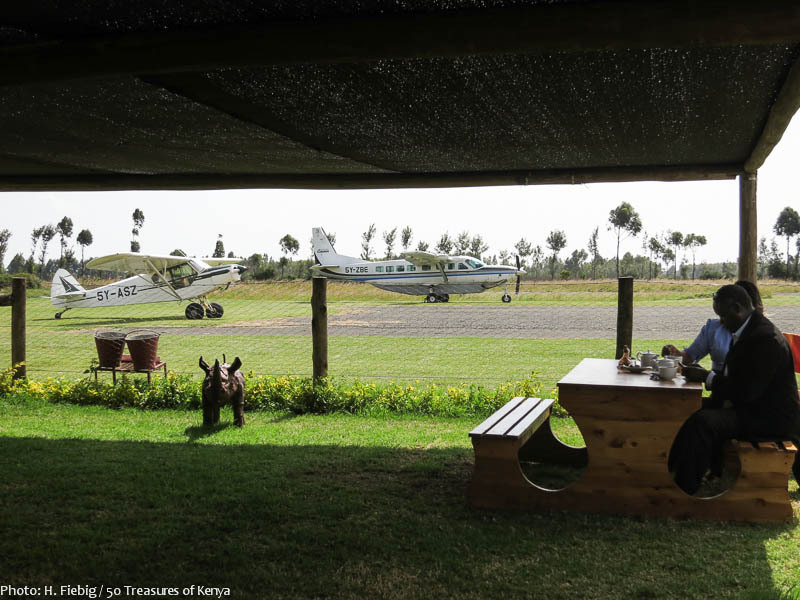 The humble Headquarters of a great organization: At Nanyuki airfield, Laikipia Wildlife Forum occupies a set of wooden bungalows, offering a lot of information materials to visitors of the region. Because the mighty Mount Kenya shields most of the rainclouds from reaching Laikipia, only small stretches in the northern part and along the rives are fit for farming. The majority of land has always been in use for grazing cattle along side with freely roaming wildlife, be it on group ranches or private cattle ranches. Many of these entities have been turned into dual purpose sanctuaries, where wildlife tourism has become another economic pillar. A holistic ranching management process ensures that cattle and wildlife promote each other instead of competing for water and forage. When the grass has grown too long for wild animals to feed on it, cattle will still graze it down, initiating fresh growth which can again be used by the wildlife. Through moving cattle bomas, malnourished and overused soils can be fertilized, rehabilitated and brought back into use as grazing land. Grazing cattle near a rainwater dam in Lolldaiga Hills. With this approach, in recent years wildlife has become an increasingly valuable asset. Many ranches have established guest houses, homestays and private camps within their boundaries and offer manifold activities. At the same time, they have consulted and supported local communities to get into the tourism trade, too. 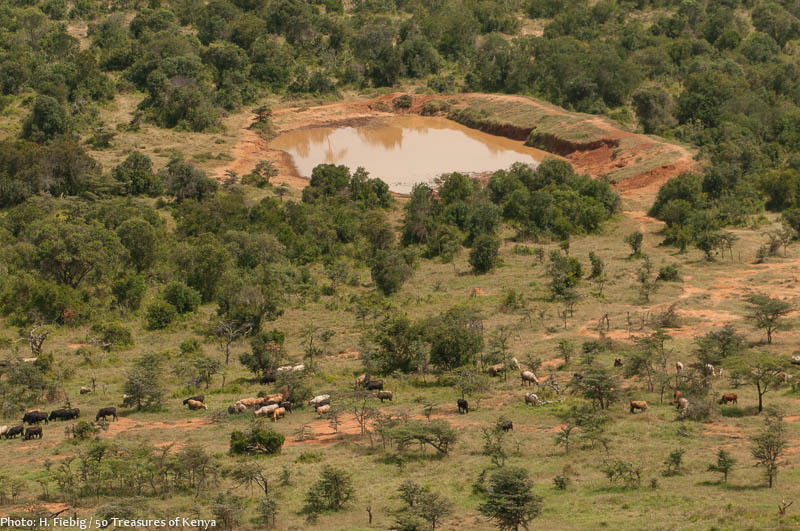 Drivers of this development, as the famous Lewa Downs or Borana have understood from the beginning, that the wildlife bounty can only be sustained if it can roam freely over large tracts of land. So cooperation between neighbors, irrespective of land ownership form and cultural background, as well as a participation in the economic benefits through tourism is a pre-requisite for the long lasting success of this approach which could be a role model for other regions of Kenya with human-wildlife conflicts and dwindling wildlife numbers. The tourist trade helped Laikipia to keep its wealth of game, including many species being endemic to Northern Kenya as it proved infinitely more profitable than agriculture or herding alone, and this allows the people to use their traditional lands in a way that is sustainable and productive. 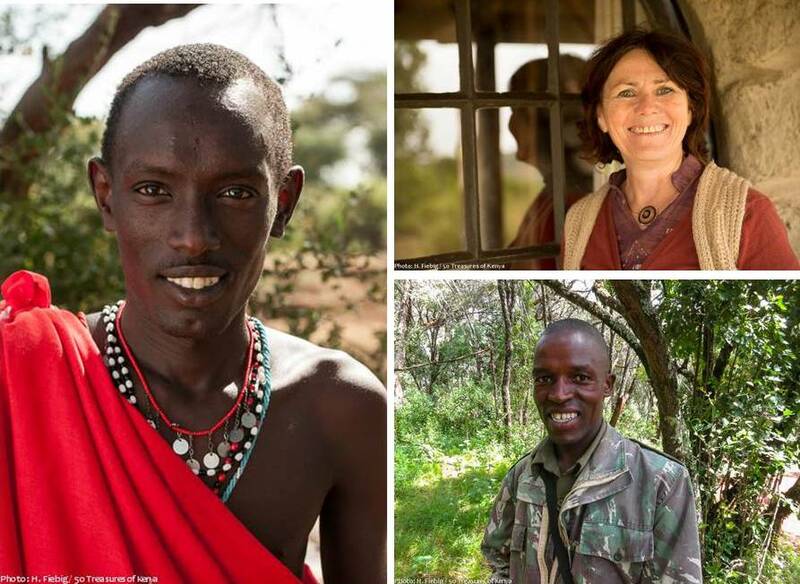 Owners of ranches and conservancies continuously invest a lot into civic education for the local communities to create better understanding for the importance of wildlife and their habitats and to encourage projects for income generation. As one of the main effects of this integrative concept, human-wildlife conflicts and poaching could be greatly reduced, which again has helped to increase the number of endangered species in Laikipia. However, the current wave of poaching needs heavy investments for security in order to save past achievements. If it would not have been for private investments in conservation from several ranches in Laikipia, the Kenyan population of rhino would have been surely rendered extinct during the slaughtering of the 1980s. Galleries with tasteful handicraft and paintings from local artists, as at Sandai or El Karama, offer you the chance to take along reminders from Laikipia as you leave behind support for the local communities. A good example for the social engagement of many of Laikipia’s premises is the Sandai ranch, which has well sorted gift shop with local products from community groups. The money earned is returned to the crafting women as a support to their income. From the above examples, we can note that conservancies, ranches and eco-lodge facilities in Laikipia aim at being 100 % sustainable by promoting conservation of cultures, livestock, natural environment and the wildlife. Breathtaking view from the Lolldaiga Hills towards Mt. Kenya, which enjoys the very first rays of early morning sun. Laikipia covers almost 2 million acres and is delineated by Mt. Kenya in the south-east. Its western borders are marked by the Great Rift Valley, as the Aberdare Range is at its south-western fringes and arid semi-desert to its north. After Tsavo, it is Kenya’s most extensive wildlife haven which encompasses 9500 km2 of the Ewaso Ecosystem’s 56000 km2 area. 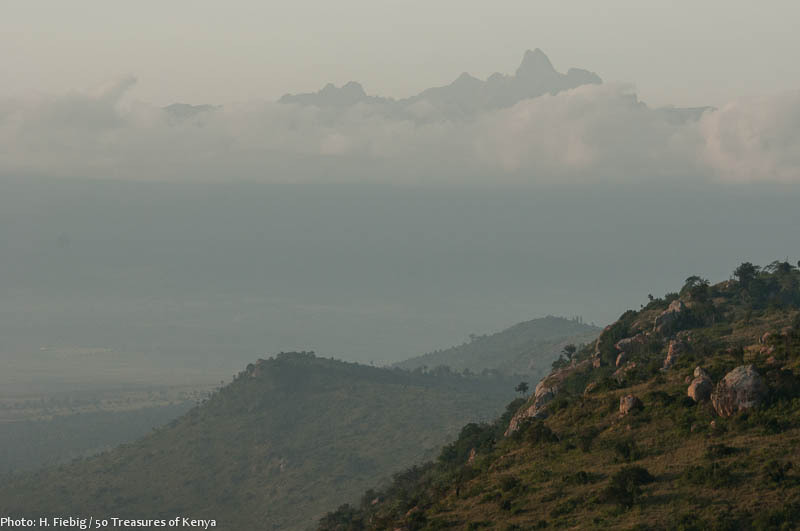 Laikipia’s unusual geography makes it distinct from the rest of Kenya. Lying between the Rift Valley and Mt. Kenya, it has been affected by volcanic activity in recent times – by geologic standards, as its scarps show. At the same time, it boasts many kopjes, which are very ancient metamorphic rocks (gneisses). 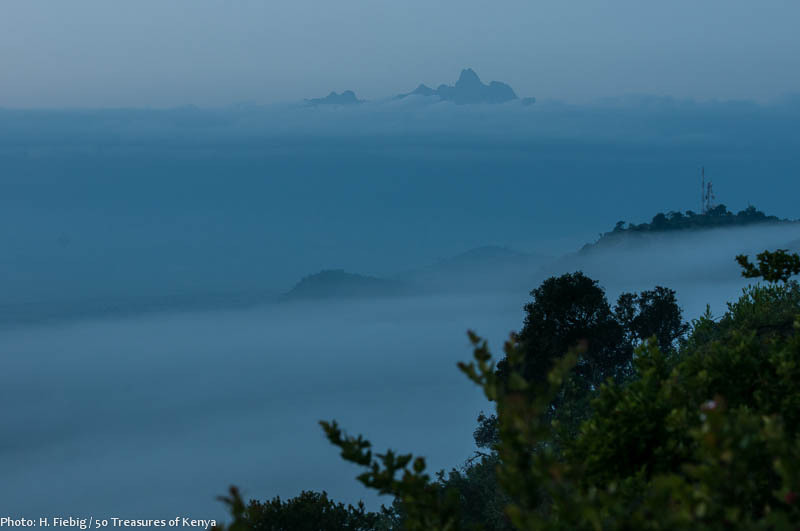 Clouds and mist add to the mystic atmosphere of the early morning’s blue hour on Lolldaiga Hills. This region has one of the most agreeable weather conditions, with a cool, temperate climate in between rainy and dry seasons. The area sees relatively little precipitation but can be deceptively cold at night during certain times of the year. Mean monthly temperatures are typically around 25o C but the northern areas are warmer. July and August are usually overcast and cool. Rainfall in the region is erratic and is highest on the slopes of Mt.Kenya and the Aberdares where annual means exceed 1000mm. There are two main rainy seasons, the longest being from March-May and the short spells in November. Sporadic showers may occur at other times of the year with exceptions associated with the El Nino phenomenon. Severe droughts also tend to occur at roughly ten year intervals. 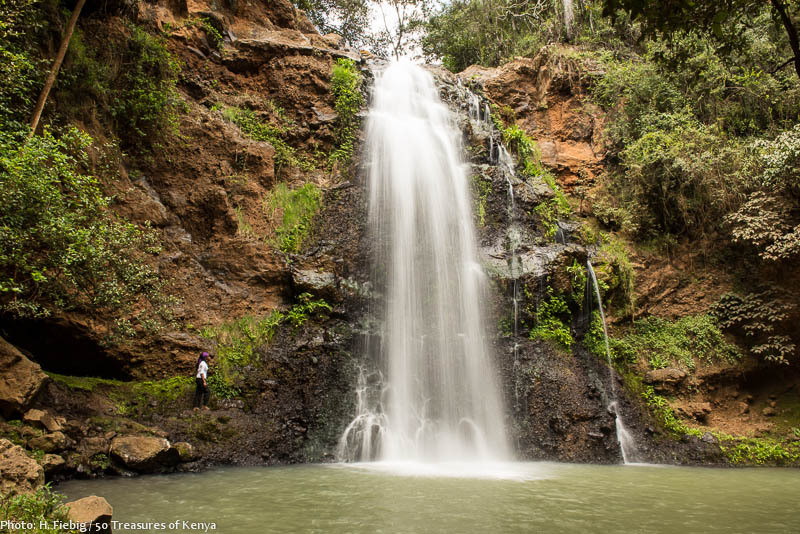 An impressive waterfall plunges into an inviting natural swimming pool within Ngare Ndare Forest. Most of Laikipia drains northward via the Ewaso Ng’iro river, which is joined by tributaries from Mt. Kenya and the Aberdares. Streams rising in Laikipia flow only after prolonged heavy rains except in swampy areas. Ranging from the foothills of Mt. 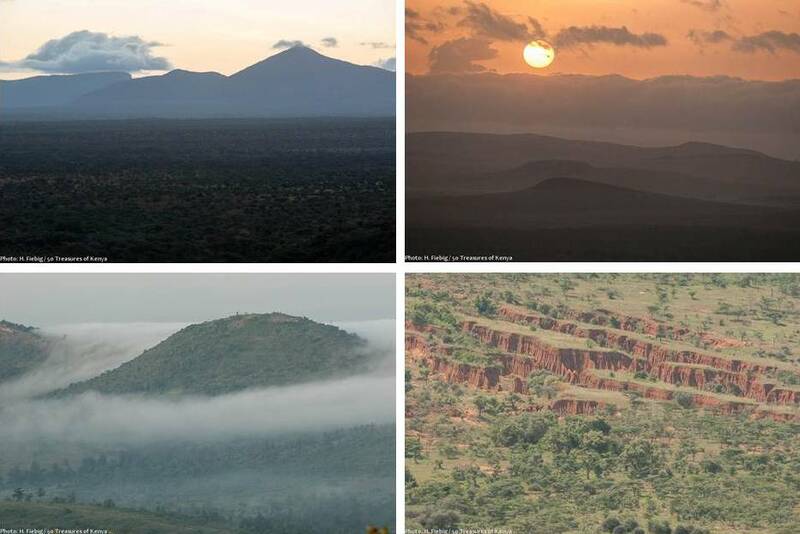 Kenya towards the north and west, the vegetation varies from indigenous forest to rock, arid scrub and steep river valleys. Forests of African Olive and Pencil Cedar once covered much of the region. Today’s more arid climate, however coupled with increased human activity have dramatiaclly reduced this forest cover. There are however seven designated Forest Reserves in Laikipia. Thanks to these efforts some once-forested areas that have been cleared or degraded have experienced a proliferation of evergreen bushland. The diversity of Laikipia’s landscapes is awesome. From top left, clockwise: Lawn with Mt. Kenya view at Lolldaiga Hills; impressive silhouette of Ol Lolokwe mountain as seen from Il Ngwesi; vast grassland savanna on Borana; view over Borana towards Ngare Ndare Forest. The dominant vegetation is savannah, comprising a mixture of grassland and open woodland. The principal habitat in dry northern parts of Laikipia is a transitional form of Acacia Commiphora woodland dominated by Acacia trees, notably Acacia mellifera. Coarse grasses interspersed with stunted Whistling Thorns, Acacia drepanolobium, are typical in the region’s volcanic ‘black cotton’ soils. Other trees cannot easily thrive in these soils, which are parched for long periods, but rapidly become waterlogged after rain. Fringing woodlands of yellow barked Fever Trees, Acacia xanthophloea, which have long been a feature in the rivers and wetlands are now in decline owing to the destruction by elephants and burning of marshland. The rocky habitats also provide secure niches for diverse plant communities which shelter a number of uncommon succulents and herbs. Within Kenya and beyond, Laikipia stands out as a model for the use of tourism for the sustainable development of the area. It is the only region of the country with an increasing number of animal count over the past years. 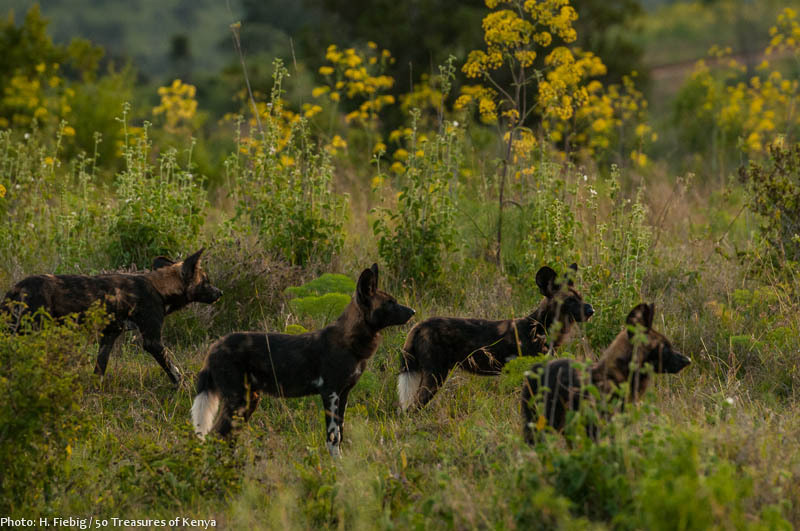 A pack of African wild dogs in the Lolldaiga Hills. With animal densities second only to the Mara, all of the iconic ’Big 5’ are still ranked higher than some rare wildlife species that can be seen in Laikipia. It also hosts the largest population of other endangered mammals left on earth including the Grevy’s zebra and the Reticultated giraffe. They include such other impressive beasts like the Greater Kudu in addition to the African wild dog. 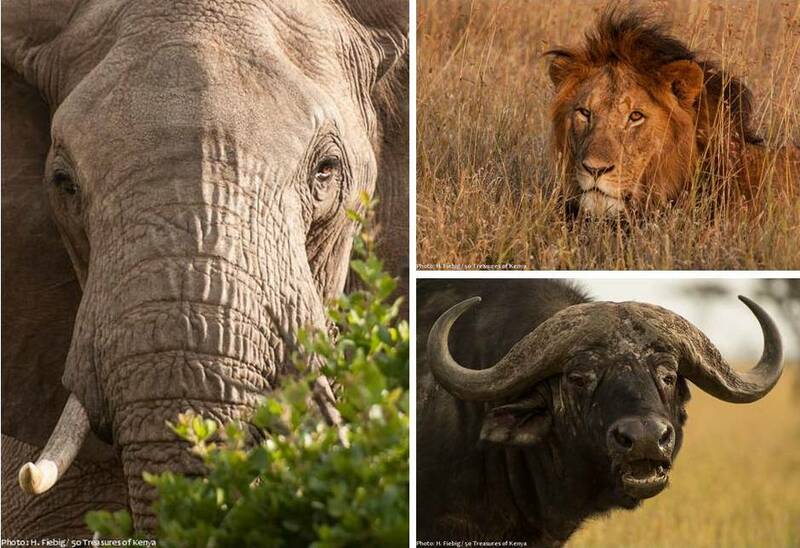 Three of the Big Five: Elephant, lion, cape buffalo. The surge in elephant numbers is mostly attributed to the 1970s poaching in the North Eastern regions. Insecurity there pushed the herds into the secure region of Laikpia, although they were typically not residents of it then. The conditions here were very favourable for the parchyderms where they could enjoy plenty of water and ideal vegetation. 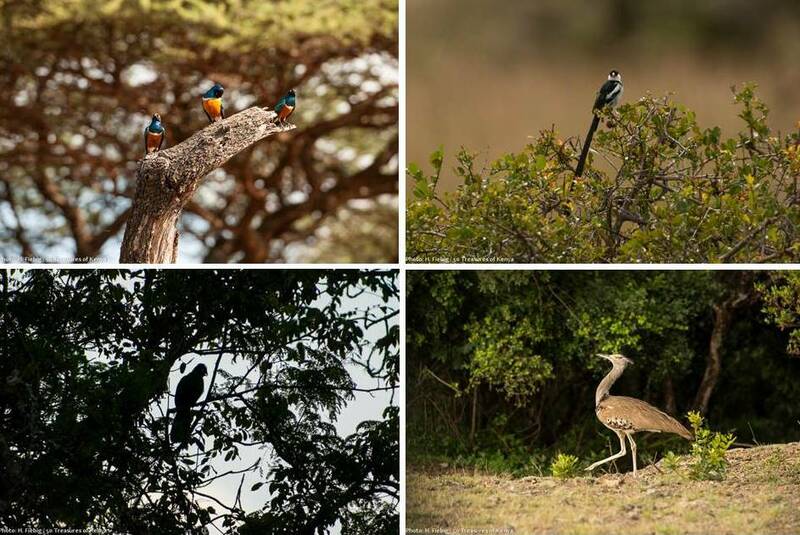 Examples of Laikipia’s superb birdlife, from top left, clockwise: Superb starlings, pin tailed whydah, kori bustard, turaco. Laikipia is a birder’s paradise and the home to over 400 of Kenya’s estimated 1,100 birds. This may actually be an underestimation as more ornithological attention is yet to be given to the region’s vast birdlife. The number is bound to rise as more bird watchers spend time searching the area’s various habitats. Some of the more elusive bird species are Crested Francolins, Whitebrowed Sparrow Weavers, the Slate-coloured Boubous, Red-Chested Cuckoo and Hartlaub’s Turaco, just to name a few. 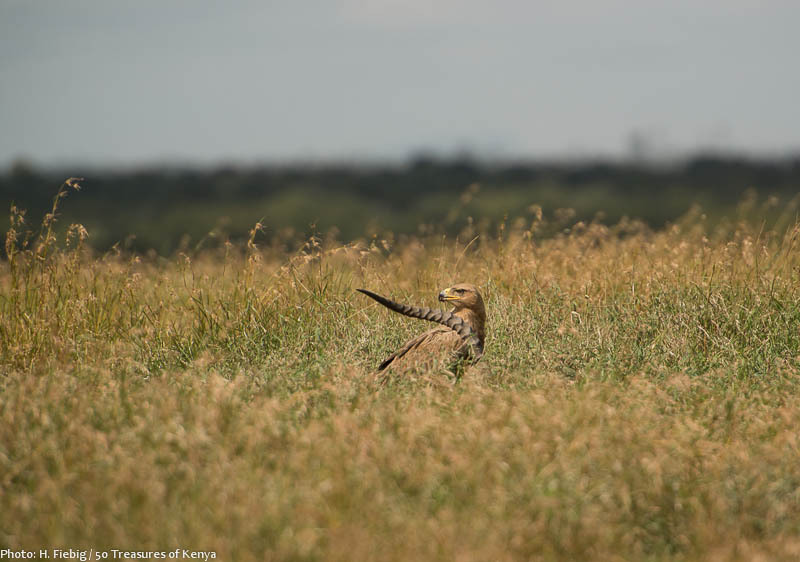 An eagle is feeding on the carcass of a Grant’s gazelle in the tall grass of Ol Pejeta. The region’s abundant mammal fauna also attracts raptors whose feeding habits depend on fresh or rotting meat. Martial and Verreaux’s Eagles are among the largest predators that rely on live kills. Some raptors visit Laikipia only seasonally, as they migrate to and from summer breeding grounds in Eastern Europe and western Asia, such as Pallid Harriers, Sooty and Red-footed falcons and lesser Kestrels. Secretary bird along with the Hamerkop and the African Finfoot are three odd looking members of Laikipia’s avifauna. 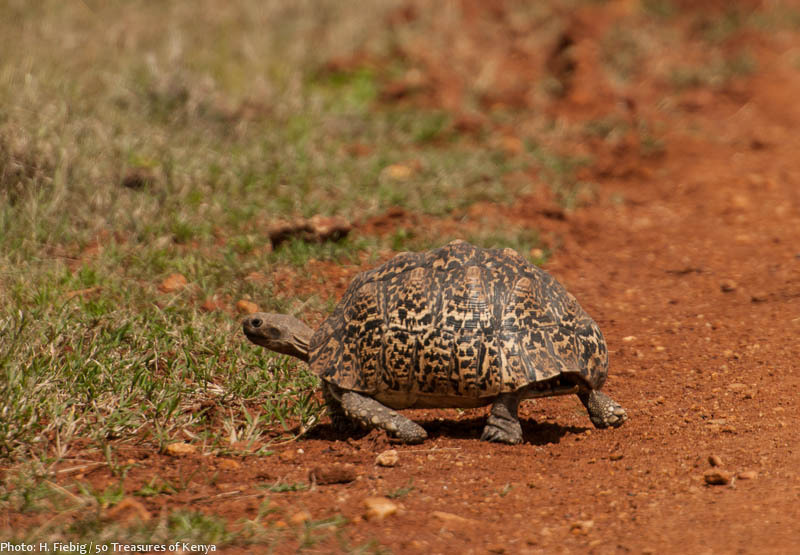 The temperate climate coupled with a diverse array of habitats ensures that Laikipia supports many species of reptiles and amphibians. Snakes, while abundant, live well hidden. Comparably easy to sport are the harmless Brown House Snake and the Rhombic Egg-eater. Deadly snakes that typically seek refuge in rock crevices and on kopjes, include the Puff Adder, Africa’s most dangerous snake and the Black-necked Spitting Cobra. The unmistakable African Rock Python is most often seen near the waters of in the streams and wetlands, along with Monitor lizards. The Red-headed Agama and the Rainbow Skink Lizard are usually seen basking on rocks or mounds. Amphibians are best observed at night and during rain when they gather to mate. 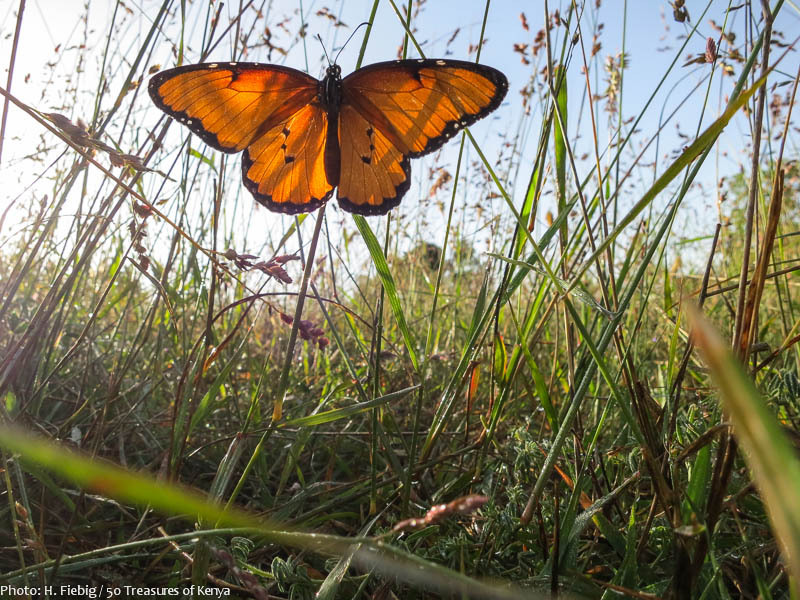 The forests and meadows of Ngare Ndare Forest are a haven for colorful butterflies. It is not only the rare animals that make this region so special. It also plays host to a great diversity of life from the smallest insects apart from the vast herds of foragers. Laikipia is home to insects of more species than all of it other creatures combined. Its most conspicuous and gaudy members are butterflies of which more than 150 species have been recorded. Other striking insects include a variety of colorful dragonflies, damselflies and the Rainbow Locust. Scarabs or dung beetles that perform a crucial ecological function are also present. The region also harbours a rich and diverse bee fauna and wasps along with colonies of ants. There are also a number of antropods which include various arachnids (spiders), as well as millipedes, centipedes, scorpions and crustaceans. 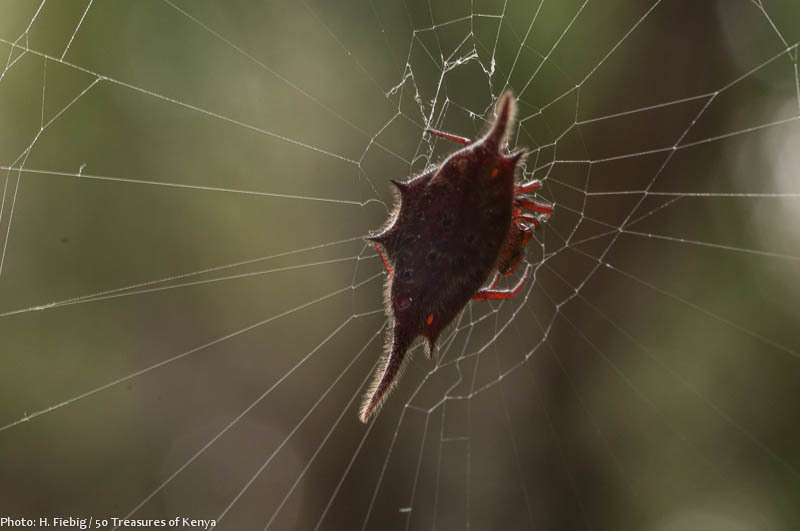 Kite spider in Ngare Ndare Forest. The Laikipia experience comes largely free of constraints and prohibitions that apply in most National Parks and Reserves. In order to promote tourism to reach the domestic market, Petra Allmendiger of Sandai Homestay suggests that tourists from the domestic market need more information about what the country has to offer. But she is very positive that soon, local guests will appreciate the untapped tourism potential within our country. Visiting a private ranch in this region is an ideal way of exploring the Kenyan wilderness while getting off the beaten paths of the National Parks. What makes Laikipia unforgettable in the end, is a wonderful sense of choice, freedom, space and exclusivity. 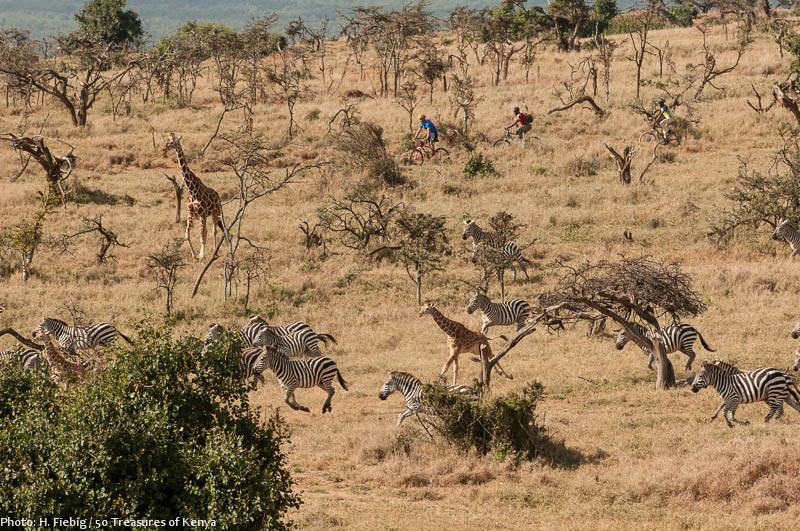 The private sanctuaries of Laikipia, as in this case Borana, offer the opportunity for unforgettable wildlife encounters on horse back, on foot or by bicycle. Interestingly enough, most of the new developments in Laikipia’s tourism have been accomplished by members of the private sector. Through popular events like the Lewa Marathon and the Rhino Charge which are held in different parts of Laikipia County, the domestic tourism market is being brought up through the young generation that attends such events. 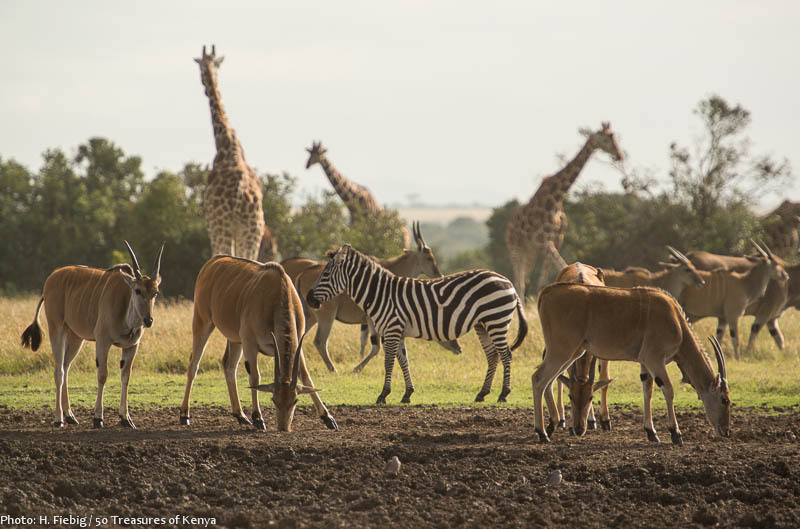 The Ol Pejeta Conservancy is a 90,000-acre not-for-profit wildlife conservancy situated on the equator west of Nanyuki between the foothills of the Aberdares and Mount Kenya. It is possibly the best known of all conservancies in Laikipia, as it offers high animal numbers and a good infrastructure as well as the largest sanctuary for Black rhinos in East Africa and a unique refuge for Chimpanzees. Apart from working to conserve wildlife, provide a sanctuary for great apes, generate income through wildlife tourism and complementary enterprises for re-investment in conservation and community development. The Conservancy also operates a successful cattle program that is integrated with the local wildlife, as cattle still plays a role in Ol Pejeta today and is still used to enhance the bio-divesity of the region. The conservancy is also keen to educate the public through its Environmental and Conservation Centre that welcomes around 100 Kenyan schools annually. It focuses especially on teaching ecology, culture and the importance of sustainable tourism. 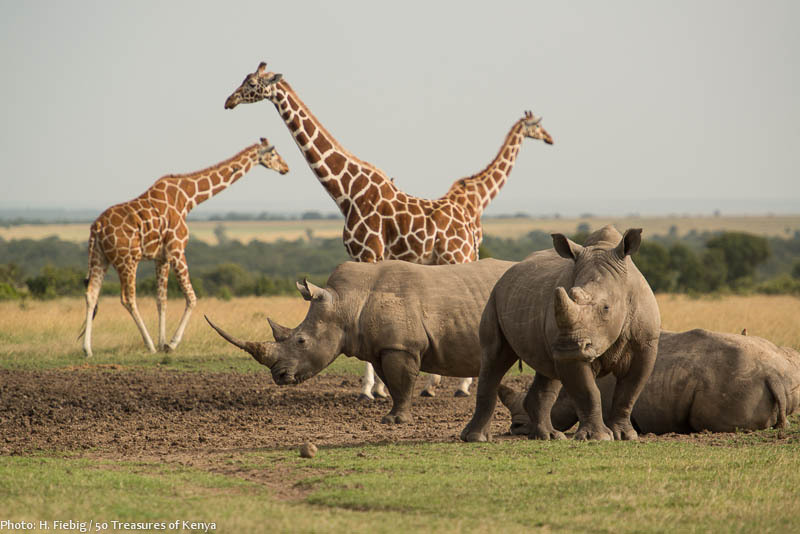 Encounter of endangered reticulated giraffe and white rhino at an Ol Pejeta salt lick. In response to the drastic reduction of rhino numbers through poaching, Ol Pejeta sanctuary was set up specially for rhino conservation. It is currently is the largest Black Rhino Sanctuary in East Africa and home to over 90 Black Rhinos (Diceros bicomis michaeli) after the single largest rhino translocation was undertaken in East Africa on February 3, 2007. The creation of this and other sanctuaries in the vicinity was designed to maximize the breeding potential, using surplus animals to re-stock other new areas. The endangered reticulated giraffe can also be found in the conservancy. Poached and abused chimpanzees have found a new, safe home in a near-natural setting in Ol Pejeta Chimpanzee Sanctuary. During your stay, you can also make a visit to the Sweetwaters Chimpanzee Sanctuary set up by the famed researcher Jane Goodall for Chimpanzees rescued from the pet and bush meat trade in Central Africa. After a negotiated agreement between the Ol Pejeta Conservancy, the Kenya Wildlife Service and the Jane Goodall Institute, the sanctuary was opened in 1993 with three chimpanzees that were brought from a facility in Bujumbura, Burundi. It was initially established to receive and provide lifelong refuge to orphaned and abused chimpanzees (Pan Troglodytes) from West and Central Africa. This is the only chimpanzee sanctuary in Kenya, with 19 others worldwide of which 7 of them are associated with Jane Goodall. Human-like expressions and behavior account for the unforgettable experience to encounter these great apes. The chimpanzee sanctuary is opened daily from 9.00a.m- 10.30a.m and in the evenings between 3.00-4.30pm. Regulation of visitors’ time is important so that the chimps can have more privacy for themselves. Visit the Chimpanzee sanctuary, meet Poco, Tess, Jojo, Max and Ajabu and learn the life journey of these rescued animals and enjoy their different expressions. You can also participate in the protection of these endangered species by adopting a chimp online at adopt.olpejetaconservancy.org. Reticulated giraffe, eland and Burchell’s zebra have a get-together on Ol Pejeta. One highlight of a trip to Ol Pejeta is the visit to the heavily guarded endangered species boma where you can get close to the critically endangered northern white rhino. There are only seven left in the world with four of them living in Ol Pejeta! The shelter also has six southern white rhinos, two black rhinos, numerous Grevy’s zebras and Jackson’s Hartebeest. Although not part of the county of Laikipia, Lewa Wildlife Conservancy is regarded as a member of the bigger Laikipia cluster which has spearheaded conservation. The 55,000 acre wildlife sanctuary is very diverse in landscapes and home to over 80 rhino, herds of elephant and other game, including the eland, zebra, giraffe, lion and the greatly feared cape buffalo, just to name a few. It is also the esteemed venue of the Lewa Marathon, an 42 km endurance race, also refered to as the Safaricom Marathon because the mobile service provider is its main sponsor. The sporting event is held yearly to raise funds for numerous community development and wildlife conservation efforts. 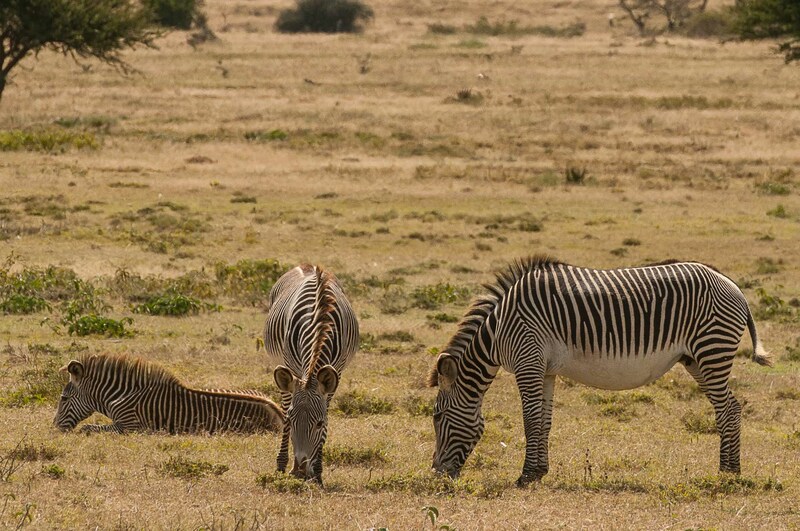 The preserve also boasts a large population of endangered Grevy’s zebra, which can be easily distinguished for its fine stripes and large ears. With Mount Kenya to the south and Samburu and Mount Lololokwe to the north, the spectacular panoramic backdrop adds to the exception experience of running amongst wildlife. For its unique setting, Runner’s World Magazine included the Lewa Marathon as being, ‘One of the top ten races to run in your life’. As a destination, Ngare Ndare forest epitomizes sustainable tourism at its best. It is administered by the Ngare Ndare Forest Trust which again is managed by the communities surrounding the natural gem together with Lewa it has been declared part of the world heritage site of Mt. Kenya ecosystem. Management of the forest strives to successfully implement all the four pillars of sustainable tourism development which entail environmental, economic, social and cultural sustainability. 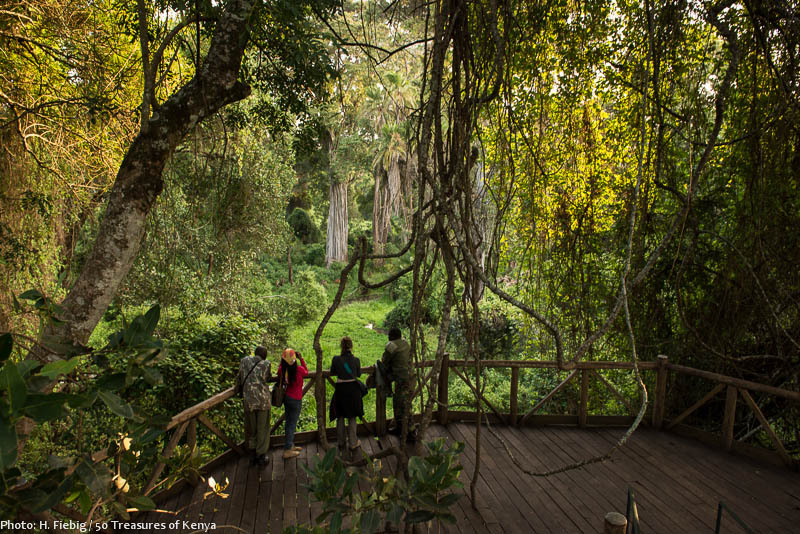 Magnificent view into the forest paradise of Ngare Ndare from the platform at the end of the canopy walk. Activities in this respect entail a tree nursery at the Ngare Ndare village, with both indigenous and exotic tree species. As indigenous trees are planted to rehabilitate degraded parts of Ngare Ndare, fast-growing exotic trees are given back to the community for their subsistence wood needs in order to ease pressure on the forest. To avoid rampant fires by honey hunters inside the forest, the Trust provides and promotes affordable beehives to use at home. Herbalists groups are allowed specific days into the forests to pick medicinal roots and plants under controlled circumstances to minimize negative impact, as are fuel collectors. Awareness by the communities that rules for a sustainable use ensures the manifold benefits of the forest to stay has greatly contributed to the success of the Trust’s work. 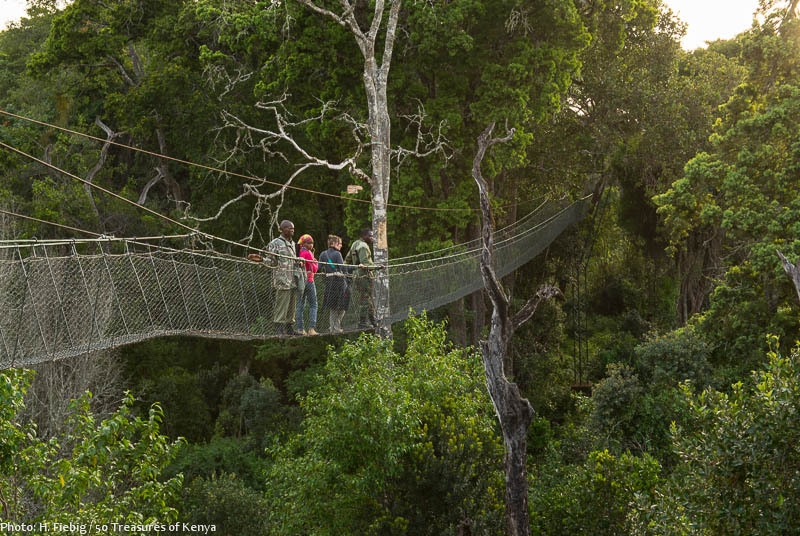 The canopy walk offers both, the exciting experience to walk in the air, and enjoy a bird’s view down into the green. If lucky, you can even see elephant below! Activities in the Ngare Ndare forest include canopy walks that enable you to see the forest from above and identify different kinds of trees. You can go for nature walks along a network of trails with local guides which carry you into its natural ambiance. Rock climbing on the nearby Nugu hill is another activity that is upcoming, as is a zip-line in the eastern part of the forest. The best time for elephant encounters in Ngare Ndare forest is from June to September. 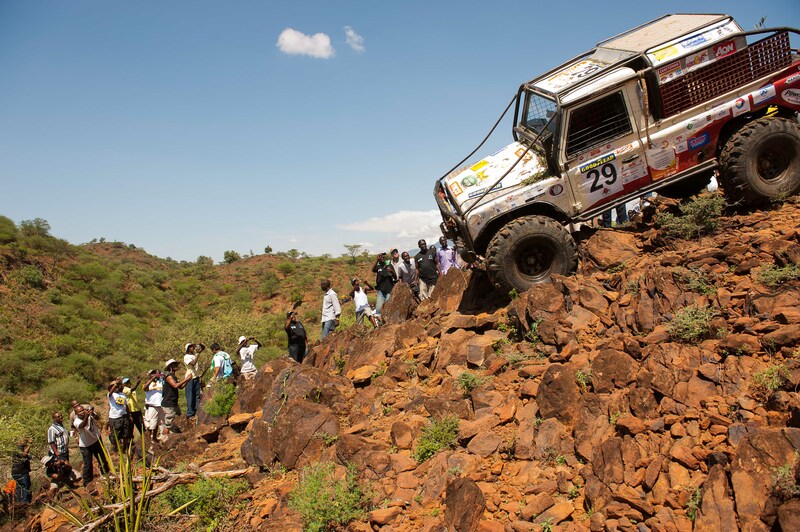 This is an another annual motorsport competition held in Kenya since 1989 in which the competitors have to compete on a strenuous cross-country course in off-road vehicles. It is a unique and exciting competition that requires mettle and a high level of skill in off-road driving and navigation. Its been a tradition of the Rhino Charge every year to never reveal the location until the actual day when the competitors and spectators collect a map to guide them to the actual route. The competitors are required to visit 13 points scattered over approximately 100 km2 of rough terrain within a 10 hour period. The winner is the competitor who visits the most controls in the shortest distance. Contestant and crowd of spectators at the 2011 Rhino Charge. The event, organized by The Rhino Ark Charitable Trust, is made possible by the kind support of our many volunteers, event and raffle sponsors. The Rhino Charge competitors on the other hand are required to raise the minimum sponsorship set by the organizing committee. All funds raised by this event are donated to the Rhino Ark , a Kenyan charity set up to help to conserve the Aberdare Conservation Area. In 2010 Rhino Ark announced its formal commitment to support conservation of other critical ecosystems, starting with Mau Mt. Eburu and Mt. Kenya. Funds raised by the Rhino Charge will now also play an important role in this. Other events held to support Rhino Ark Charitable Trust are the Quattro Charge, a 4×4 trials event, and the Hog Charge for children using mountain bikes. Laikipia county has two major urban settlements: Nanyuki, its administrative center in the southeast, and Nyahururu on the southwestern fringes. 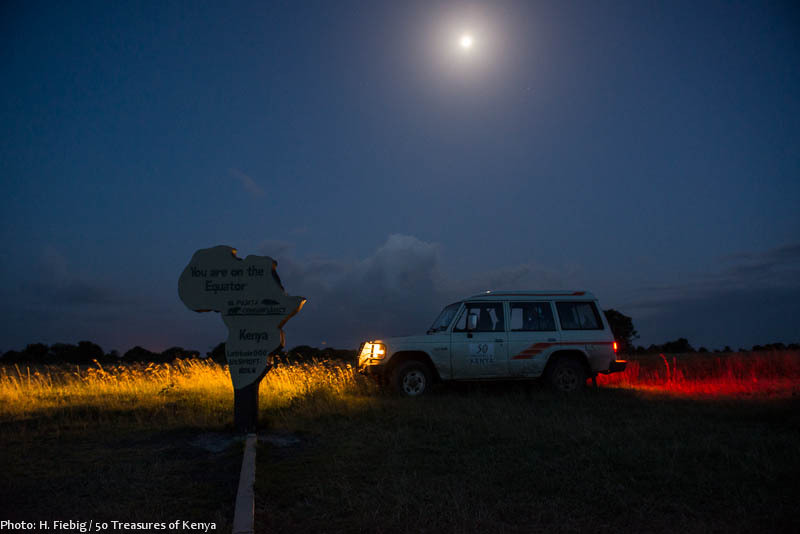 Visiting the equator monument at Ol Pejeta, as the full moon is rising in the back. To drive travel around Laikipia, a 4WD is obligatory for most regions. 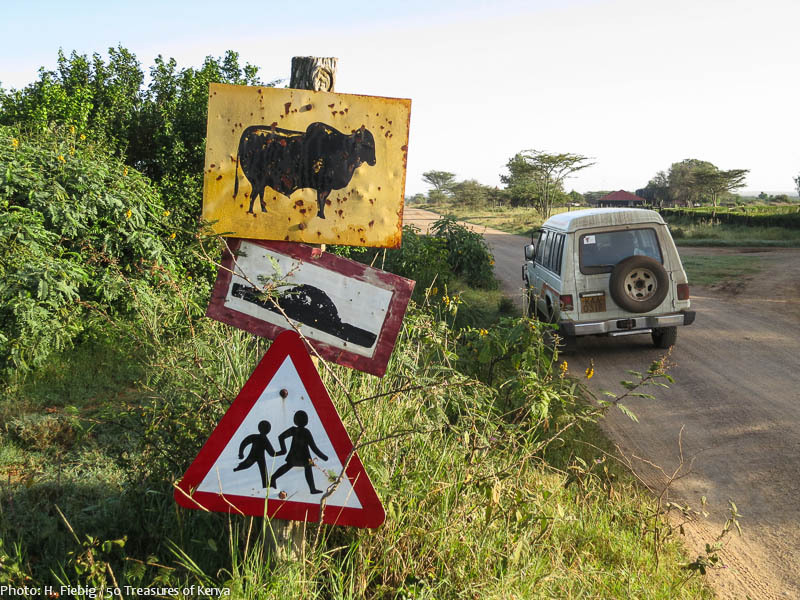 Although most premises offer walking safaris or even bicycling, make sure you never go into the wild without a knowledgeable guide as wild animals can be extremely dangerous. 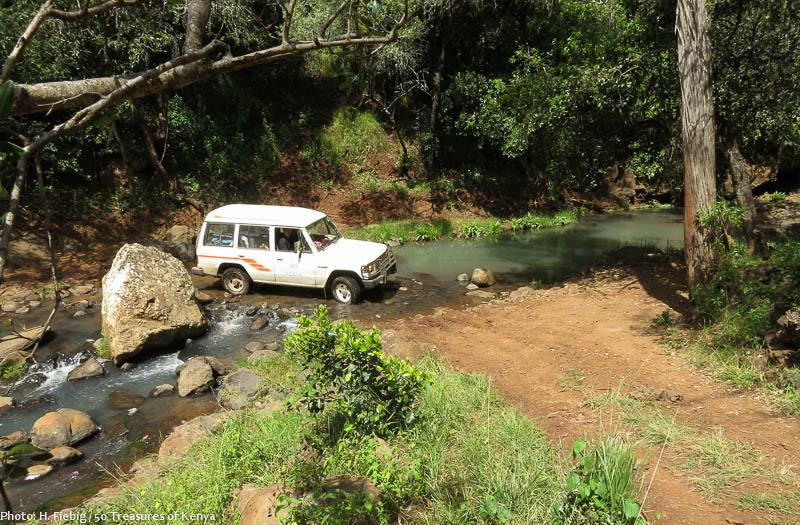 Crossing the refreshing waters of Ngare Ndare River. The imposing silhouette of Mt. 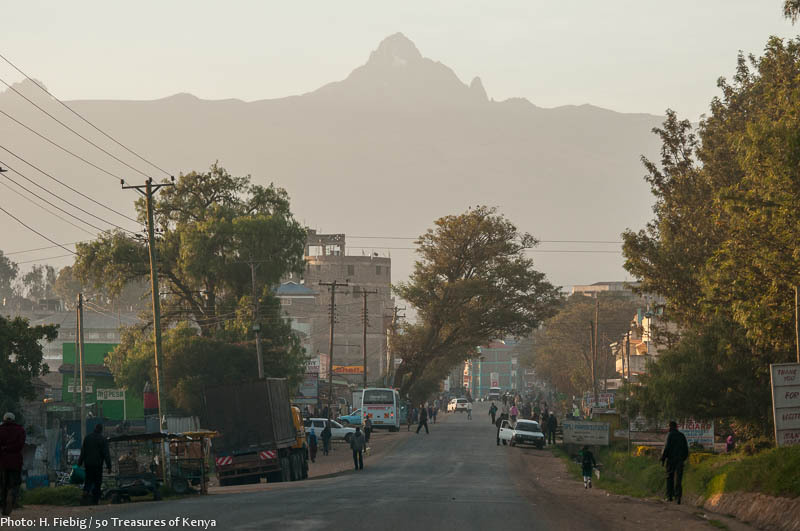 Kenya is guarding the streets of Nanyuki on a clear early morning. As much as Laikipia is one of the top attractions of Kenya, it is important to remember that many of the ranches and the roads therein are privately owned. Some ranches allow day visitors with their own transport, others do not. In any case, visitors should always make enquiries in advance. If you are visiting a ranch with your own private transport, ask for directions and preferably a map in order not to get lost. Many ranches and sanctuaries have their own airstrip, which can be used by charter aircraft. Most ranches will be happy to arrange for transfers of their guests directly by air or road from Nairobi or any other destination as part of their service. Laikipia, the Land of man, cattle and wildlife ensures you unexpected encounters – so drive slowly and keep remembering: Cattle and wildlife have always the way of right! Nanyuki is approximately four hours’ drive from Nairobi. Laikipia can also be accessed via tarmac road from Nakuru and the Rift Valley via Nyahururu, from Lake Baringo on a murram road and from Isiolo and Meru via tarmac. To move around Laikipia, you will either have your own 4WD or make arrangements with your accommodations and/or the conservancies for an all-terrain vehicle. Nanyuki’s laid back airfield is served on a daily basis from Nairobi by various airlines. It is, too, the hub for flying safaris further to the North, be it by helicopter or plane. Daily air services are provided by Air Kenya, Safari Link and Fly Sax from Nairobi to Nanyuki airfield. Most conservancies have their own airstrips open to charter planes. Charter planes and helicopters are available through Tropic Air Kenya-www.tropicairkenya.com. 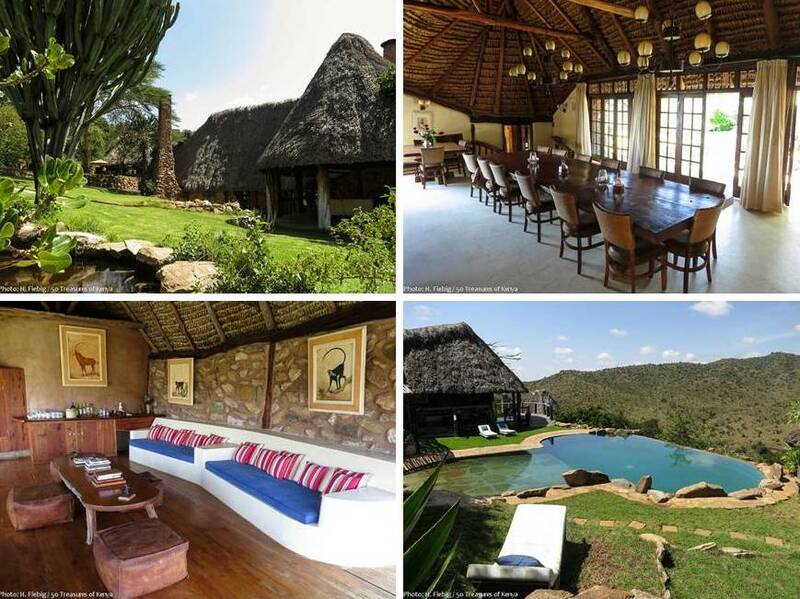 Premises in Laikipia offer you both, a wide array of options for activities, relaxation and accommodation. Game viewing tends to be more intimate and adventurous then in the popular National Parks in other regions of Kenya.The emphasis here is on personal services, backed up by excellent local knowledge and guiding. As a personal guest, you will have the chance to set your own schedules, explore at your own pace, and discover the wild in your own way. This exclusivity has its price, though. Full moon raising over the roof of Il Ngwesi Community Lodge. Il Ngwesi community lodge stands out as a community owned facility by the Maasai people of the group ranch bearing the same name. 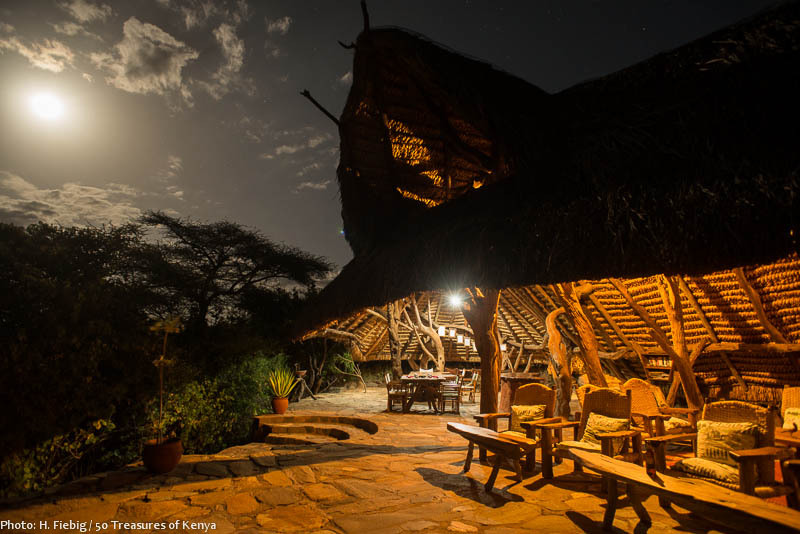 It is one of Kenya’s landmark community owned eco-lodges. In order to integrate and promote the Maasai culture, the community lodge has a policy to employ only the members of the local Maasai community. Cottage and star bed at Il Ngwesi Community Lodge. Constructed from local materials in exceptional design, Il Ngwesi can stylishliy accommodate up to 16 people in 6 open plan cottages and owns a wonderful swimming pool. 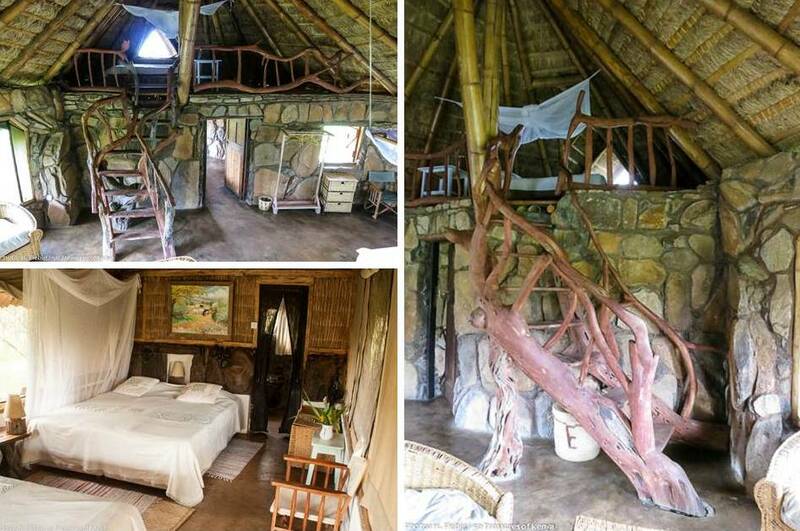 The rooms are facing Mukogodo Escarpment and perfectly blend with the local environment while adopting some features of a manyatta, the homestead of the Maasai people. Prince William and Kate Middleton have enjoyed the serenity and very special flair of the place in the past. Game drives and game walks, breakfast at the river side and visits of a Masai cultural village are some of the activities offered. England and Africa blend the best of both worlds to a distinguished style at Borana Lodge. Borana is a 35,000 acre ranch comprising of a patchwork of gentle hills and vast savanna land which is home to a multitude of game and cattle. Plans are underway to introduce rhino to the farm and break down the fences with the neighboring Lewa premises. As one of the first to get involved in exclusive tourism, Borana has been both, a popular and most successful premises, supporter and consultant to Il Ngwesi Community Lodge and Tassia Lodge. Eight 8 luxurious ensuite cottages can accommodate up to 16 guests, offering an abundance of style, space and privacy. Activities on Borana entail, day and night game drives, walking safaris, horseback riding and mountain biking, amongst others. El Karama offers a set of individual accommodation right on the banks of Ewaso Nyiro River. Situated on the banks of Ewaso Ng’iro River, the eco lodge offers 4 double semi tented rooms, a family cottage and a spacious rondavel. The 15,000 acre working ranch on which the lodge operates is just an hours drive northwest of Nyanuki. This is a viable place for experiencing the wilderness of Laikipia epecially for families, as El Karama Eco Lodge offers many activities for children. The staff is caring and knowledgeable in making tracking, fishing, natural history and other activities a real adventure for the kids. 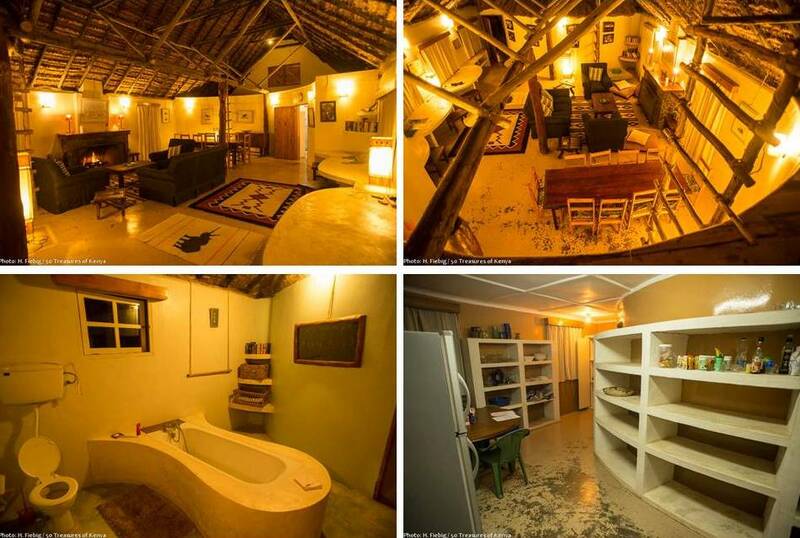 For those who look for an unique homestay experience, Sandai will be an excellent bet. Petra Allmendinger is a very engaged yet sensitive host who has created a cosy home for her visitors. If needed, Petra is happy to share her rich knowledge on the nature and culture of the region and accompanies her guests on tailormade safaris. 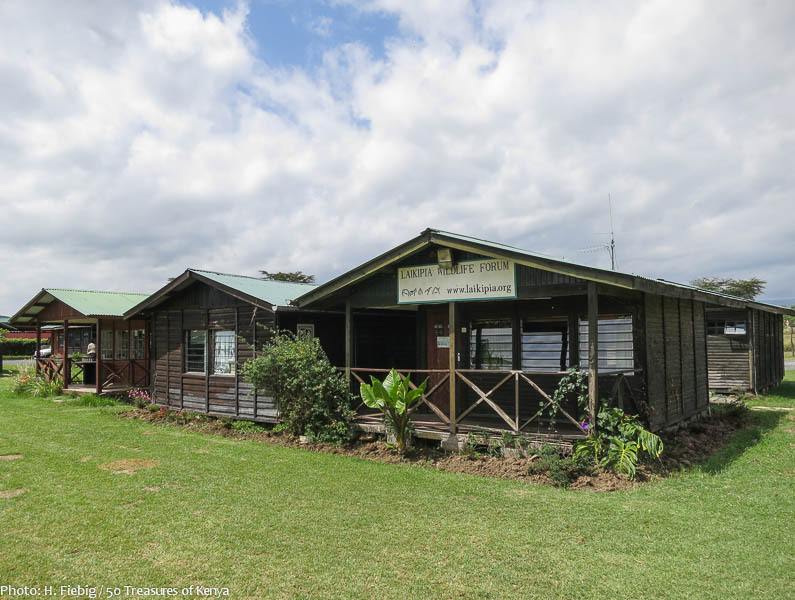 The homestay and cottages are located in the vicinity of the Aberdares National Park, most offer a fully equipped kitchen with cutleries, stove and kitchen for those who prefer to cater for themselves. Camping and horse riding are also available. 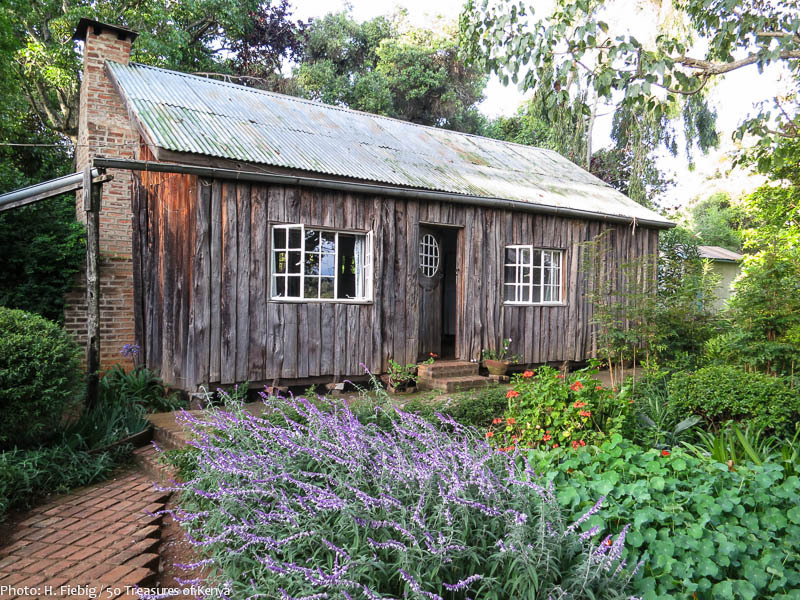 Sandai House on Sangare Ranch offers you a fairly priced, yet cosy home away from home, under the personal attention of your host Petra Allmendinger and her team. 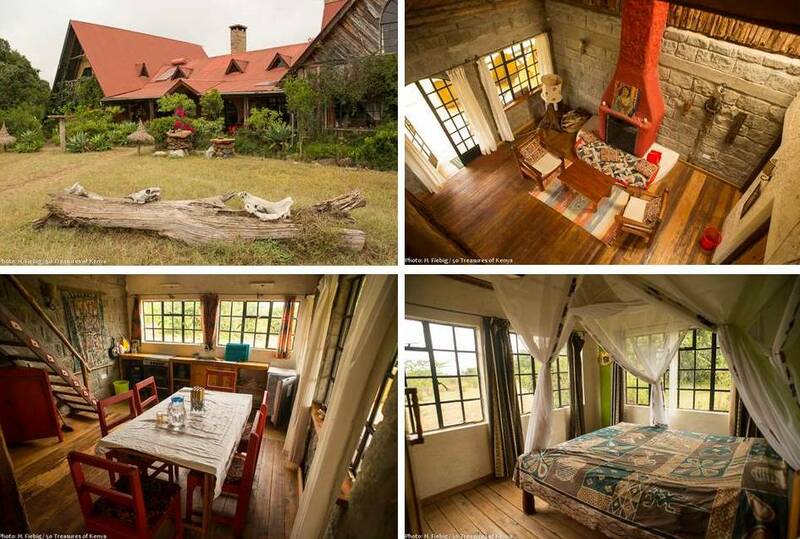 Originally the home of famed multi-millionaire Adnan Khashogi, Ol Pejeta House in the heart of the Conservancy is managed by Serena Hotels. It is furnished with original and unique paintings and artefacts and offers exclusivity for 12 guests in 6 luxury suites. Camping and luxury can go well together, as Serena’s Sweetwater’s camp is proving with its stylish Safari tents. Sweetwaters Tented Camp features thirty-nine safari tents, each with its own private veranda overlooking a nearby, much frequented waterhole, offering a charming blend of under-canvas ambiance and safari luxury. The current re-construction of the reception, dining, lounge and swimming pool area will add further comfort to the excellent accommodation. The appearance of a log cabin from the outside is reflected by the cosy interior of one of the minor buildings of the Farm House in Lolldaiga Hills. Lolldaiga Hills might be one of the best kept secrets of Laikipia as it has not been into proper tourism operations until very recently, yet the conservancy offers some of the most beautiful landscapes of Laikipia and – on clear days – a breathtaking view to Mt. Kenya as well as a bounty of wildlife, including African wild dogs. The Farm House sits in the centre of Lolldaiga Hills, facing the mountain, surrounded by a lush garden and a vast lawn with perfect green. It is a place of perfect serenity. The farmhouse consists of a traditional cedar building with 2 double ensuite bedrooms and an additional outside cottage. Although self catering, a cook and a kitchen help are available. Activities comprise of game safaris, nature walks and horse riding. 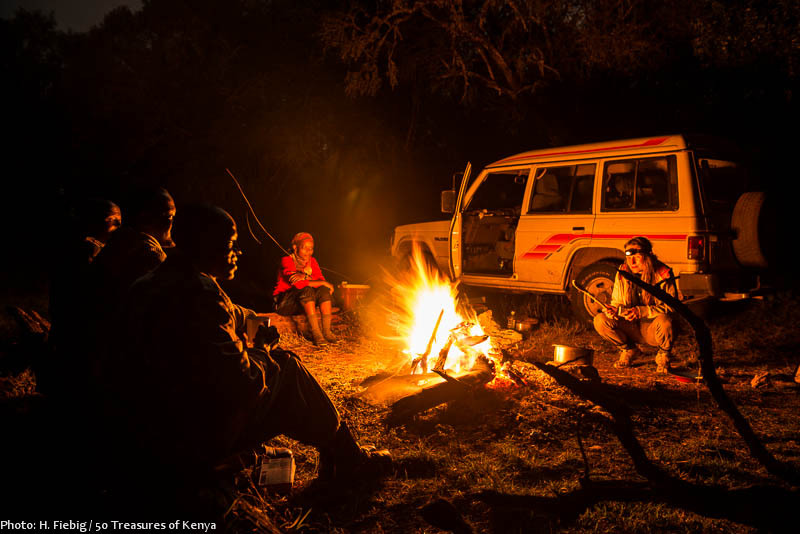 Sitting under the stars at the campfire, telling stories of an eventful safari day and stare into the flames of a warming log fire, as you hear the sounds of the African night, becomes an unforgettable experience you might get addicted to. Ngare Ndare forest is the perfect get away for those who enjoy walking, picnics and camping. So far, the community manages two campsites with basic facilities, such as a toilet house, water for washing and cooking is available from the river. Part of the real outdoor experience is a cracking campfire in the evening. If you are lucky, elephant and buffalo may visit your campsite at night. So make sure you are not walking around alone without one of the armed forest rangers! Highlight activities in Ngare Ndare are forest walks, the unique canopy walk, a new zig-line to opened soon and bathing in the wonderful rock pools of Ngare Ndare forest. We trust that this feature has been informative to you. We however regret that some information previously included regarding El Karama Ranch was inaccurate and extend our sincerest apologies to El Karama Limited for any misunderstanding or misrepresentation. If this feature has been beneficial indeed, please take it a step further and spread the message, like it, share it and follow us as we countdown to Kenya’s 50th birthday! You really show us readers treasures and exotic spots! Do you allow me to write about your blog, and to use some of your pictures inside of the article? Its always a pleasure to share a treasure as we say. Its also a delight to know that you also appreciate these Treasures and exotic spots. Please feel free to proceed as suggested and contact Mr. Fiebig for more details on his info@hartmut-fiebig.de address. We’d really appreciate it and please contiue following our highlights as we countdown to Kenya’s Golden Jubilee. Hope to hear more from you soon.